The next step was for the party to escape the ziggurat. The party prodded around in the black pools of acidic tar and searched the base of the structure but could find no further way out. Mendel and Zhedd tried to communicate with the ziggurat, and saw some level of response but struggled to make out anything intelligent from it. Back at the uppermost level of the ziggurat, Dacien, created a sensor to view the exterior, and saw a squad of the remaining kopru and troglodytes slowly working their way up to surround the sphincter-like exit. The party prepared another two-pronged assault - Dacien dimension dooring with Stefanie, Ji and Faldak into the midst of one band of kopru, and the others working to provoke the sphincter into opening so they could escape and attack the other group. After a few swift round of melee and fireballs, the party had taken the ziggurat. Questioning some kopru that surrendered, they learnt that others had fled the chamber, but they knew little else about operations here. Apparently the kopru leader the party killed previously was responsible for liaising with a groups known as 'skinwalkers' that arrived from the 'city above' through the tunnel in the ceiling above the crater to the north. They delivered the pearls to the kopru, who then fermented them further in the ziggurat before passing on to the troglodytes to deliver to the pirates, the Sea Reavers of the Crimson Fleet. They had little dealing with the events outside this cavern itself. The skinwalkers were described as some mixture of human and rakasta, but it wasn't clear exactly what they might be. The party holed up in a side chamber to rest and recover spells. During their watch, Dacien and Ji spotted a ant-like creature climbing a structure a few hundred feet away, and making some notes, before returning to the west, where the crater was. Before setting off after their rest, Mendel fired an arrow with a message into the crater, to ask the creature they left there, Rakis-Ka, if their may return and examine the sealed tunnel above - and to parley about this in a clearing to the south. Rakis-Ka bellowed angrily that he would not abandon the crater for them to move in, and as per their bargain he expected to be left alone. 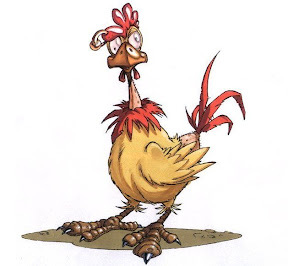 Mendel then found himself mentally compelled to leave the chamber, and as it had been his idea to pester Rakis-Ka in the first place against the others wishes, the party happily went along with it until they got to the exit tunnel, where Dacien broke his enchantment. The party felt that to completely destroy the production of the shadow pearls, and to find the master pearl that controlled them, they would have to continue their exploration on the city above, which the korpu had indicated was at the highest point on the island.Stefanie used find the path to confirm that the only clear route to he plateau was back the way they came, so the party struck back out down the tunnels. The route was mostly clear, but the party sought out the aboleth they had encountered previously to put an end to it. 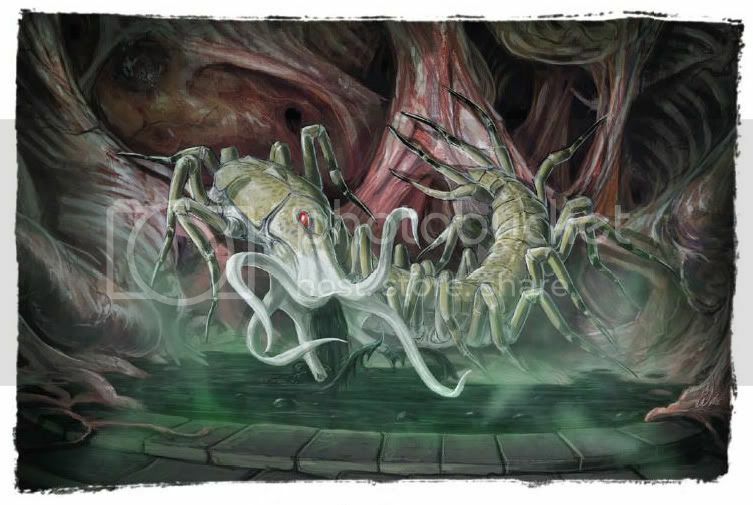 The found Irgzid sitting in the chamber, claiming the aboleth was dead having been killed by some kopru that fled the chambers below, and he was waiting for their return. The party saw through the ruse, and Mendel and Faldak started firing arrows into the water as Stefanie lowered its level to leave the aboleth no place to hide, despite its illusions. Mendel dove into the stagnant slimy water, only to find himself left unable to breathe air by the aboleth slime, and that his cursed fishing rod finally activated to summon a shark in the water next to him. After much use of create water and portable holes, Mendel was finally restored. In the chamber with the shimmering barrier, the spirits seemed more restless, and as Stefanie and Ji passed through, they heard cries of "He's eating us, he's eating us! You let him eat us!". Stefanie later prayed to Vanya, and was told that certain immortals were disappointed in her actions, but Vanya was looking forward to a battle that was looming. Mendel also prayed to Asterius, and saw only visions of a bone abacus and a longing to tally up greater profits. The party made it to the exit, checking in on the albinos on the way and finding their settlement deserted, and then sought to scale the cliffs to reach the island surface. Atop the cliffs, they found themselves on a mountain range and in the distance towering above these and shrouded in clouds, they spotted the plateau the kopru had mentioned. Stefanie attempted to carve Dacien's face into the rocky terrain to make the area distinctive for a return teleport and the party then decide to head back to Farshore to rest, identify gear, sell items, and prepare. In Farshore, the party reported back to the council on events, and learned of what had been happening since they departed. The bar owner had fled, leaving Lil and the other saved prostitutes in charge of Krunk's bar. A ship had left Farshore for Sasserine carrying good to trade and to try and entice traffic back to the port - also carrying some residents that had decided to flee for a safer existence. A dragon turtle had been spotted in the harbour, but keeping its distance. Finally, Vanthus' body had been stolen, which given the tracks the party deduced to have been taken by Leaping Demons. Stefanie scryed but could not find him. Vesserin, the head cleric, also let them know that the feebleminded warrior they party had rescued was in his chapel - strangely comforted there more than elsewhere in the settlement. He had also noticed that some of his tattoos echoed imagery of the immortals Djaea and Khronous. Stefanie healed the tribal warrior, and, his mind restored, he introduced himself as Jakara. He had been sent to the seven villages by Noltus Innersol, a missionary priest of Ixion, to warn them of the demon threat on the plateau, which in recent times had increased its attacks on the jungles below. Noltus, travelling with his bloodhound dog Bulgan, had banded together humans, lizardfolk and phanaton to fight these 'skinwalkers' which Jakara described as his fellow tribesmen taken by the demons and somehow bonded to rakasta's cat like bodies in some unholy amalgamation. He offered to train the party in fighting demons, but his main goal was to help prepare the other villages to defend. Noltus had also asked him to recover his stone medallion, which apparently had caused him visions that originally led him to the island. Vessrin explained he had visited Farshore some months back, drawn by his visions, and left the medallion with him for safekeeping. Noltus seemed to be drawn by his patron Ixion to uncover some legendary item on the island. 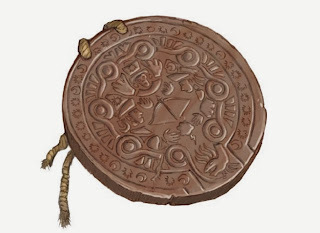 The medallion itself seemed to depict the immortals Oloron/Odin (moon), Otzitiotl/Ixion (sun), Manwara/Protius (stars) and Kalaktatla/Ka (knowledge), working together to create a bow. The party agreed to take the medallion to Noltus on the plateau, after they had visited Sasserine to equip themselves for the battle. Mendel asked Manthalay for a letter of introduction to the arena in Sasserine for business, and Manthalay agreed, saying there may be other items he could also take. Pinned down against the side of a strange fleshy structure by the advancing kopru, the party decided to retreat to a more defensible position. Mendel covered the other as they fled to the west, where they had seen various caves in the wall of the larger cavern. They were dogged by a pack of the larger kopru who were flying in a pincer formation. Zhedd caught two within a cloud of choking gas, and took to the air on Banshee to cover the party from above. Mendel wore them down with a few arrows before taking after the party. By means of Stefanie's haste spell, they made good time across the bonemeal-like covering of the cavern floor - until Stephanie found herself encased in a dome of stone by the kopru's magic, Ji rolling out of the way before he could be caught. The rest of the party continued their retreat and made it to the cave, where Faldak found two dead human bodies frozen in grotesque positions - one as though cleaning up the mess made by his entrails spilling out over the floor, and the other with a grossly distended belly. They showed no sign of (un)life, so the party made their stand here, although Mendel did find the distened belly hid a strange stone flask with the sigils of the immortals Khoronus and Djaea, which later resisted Dacien's attempts to analyze. What followed was a sniping battle against the korpu, relying on Dacien's dispel magic to hamper the lead korpu. as Antony and Zhedd flung fireballs at the others. Mendel sniped lightning arrows at the kopru cleric, and Faldak and Ji met the weakened kopru warriors as they landed at the cave mouth. Meanwhile, Stefanie, encased by stone, used a combination of water breathing, create water, and control water to fashion the dome into a mobile tank, and tried to move after the party before starting to dig her way out. The kopru ranks were whittled down, and the kopru cleric left exposed and unprepared. It began to retreat, hounded by Zhedd and the fireballs, until it finally died at the edge of one of the pillar of purple flame. The party swiftly moved in to collect the fallen items the kopru carried and then retreated to a cave higher up the cavern wall where they could hide and rest up. The cavern was filled with the dried age old bone of humans that must have lain there for centuries. During their rest, they saw a band of kopru visit the strange stone plug in the cavern ceiling above the crater. After resting and preparing for an assault on the ziggurat, Zhedd visited the stone plug to analyse what the kopru were doing and found signs of them scratching the stone, but nothing else. The noise of spell casting from the strange cloaked figure left in the crater below told Zhedd he had been spotted, and he hastily retreated. The attack on the ziggurat relied on two stages - an assault with magically conjured fire and ice, before Dacien dimension door'd the melee warriors to its peak. Mendel, Antony and Zhedd used potions of fly recovered from the korpu bodies to join Zhedd flying in to the ziggurat, as Dacien took Ji, Faldak and Stefanie into battle. They appeared atop the ziggurat, next t othe puckered, bruised sphincter-like entrance. Three large kopru waited there, worn down the the ice storm and fireballs, and were quickly dispatched by Ji and Faldak, as Stefanie conjured a blade barrier to wall of two additional korpu that were flying in from the entrance tunnel to the east. This mass of swirling barriers also tore into the sphincter, ripping it opwn and revealing a chamber beneath. Around the base of the ziggurat, naga and kopru minions gathered and tried to hamper the party's movement, but to no avail. The party regrouped on the ziggurat, and with Faldak's axe joining the blades, dove through a hole in to the centre of the ziggurat. The walls of the interior were lined with blackened lung-type structures, and eyes swarmed to the surface of the muscular construction as the party approached. The entire fleshy mound quivered in pain, but otherwise did not react. They party found a chamber that belonged to the kopru cleric, with a large statue of Demogorgon that Mendel defiled by removing the gemstone eyes. Some of the kopru's belongings were also hidden on a large tumorous lump that had been fashioned into a grotesque couch. A trap door led to the final chamber at the ziggurat's base. Opening this, Mendel was his by a blast of flammable acidic black goo by a strange centipede like creature that was swimming in a large pool of the same dark liquid . Also floating in the pools were several large black pearls, coated in differing amounts of crystalline growth. The trapdoor was quickly closed as the party planned their attack. Faldak was warded from acid by Dacien, and led the charge against the creature. Ji managed to tumble behind it, and with two quick blows stunned it and allowed Faldak to line up the killing blow. The pool it was in started to harden as the life left its body.